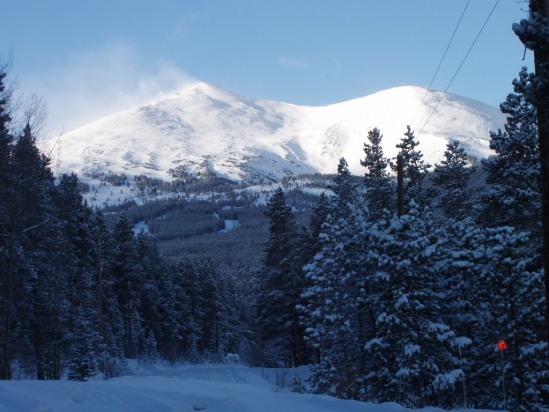 Our home is located on a ridge above Breckenridge and features a very private setting with awesome views of the ski area and surrounding mountains. We are approximately 2-1/2 miles from the peak 7 and 8 base areas, Gondola lots, or Main Street. With 4 bedrooms, two living areas, a huge wrap around upper deck,lower deck with hot tub, and 3 fireplaces, you will have plenty of room for your family and friends to make yourselves at home. Downstairs is the family room, pool table, fireplace, bunk room with queen and bunk bed , laundry ,and wet bar.The hot tub is located just out the french doors on the lower deck. Upstairs you will find the master bedroom with a jacuzzi tub and fireplace, two additional bedrooms each with queen bed, the great room featuring another fireplace and access to the upper deck areas, as well as the well appointed kitchen. Parking is either in the two car heated garage or in the large driveway.